Now that summer has reached its peak there is nothing better than catching up with friends and family over a relaxing meal in the garden – eating alfresco is one of life’s greatest pleasures, whether the food has been cooked on a barbecue, outdoor oven or has been prepared indoors and served at the table. 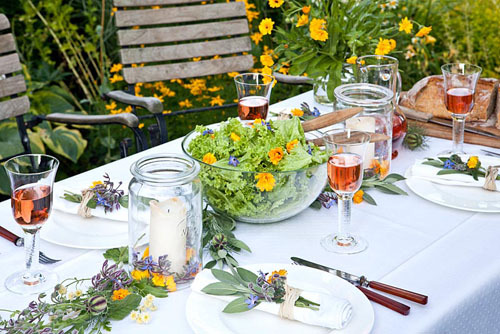 If you’re planning an outdoor dining area, give careful thought to its design; nobody likes to be engulfed by the fumes from the barbecue as they eat, so keep seating and cooking areas separate – it’s easy to do this in a large garden, but when you’re strapped for space, consider dividing the garden using different levels. As it can be uncomfortable eating in the glare of the sun, make use of the shade provided by nearby trees or put up a canopy, parasol or shade sail. It’s best to choose furniture that suits the style and size of your garden. A rectangular table is ideal for most, but if you have a tiny patio, go for a bistro-style set. Dressing the table will add the perfect finishing touch. Here, calendula, borage and love-in-a-mist makes an effective display, while storm lanterns add a romantic mood when the sun goes down. This entry was posted in Expert advice on July 31, 2014 by gapadmin. Having your own outside space is a wonderful reward to having a hectic lifestyle. The ability to sit and relax and enjoy being close to nature is a welcome respite to a busy life. 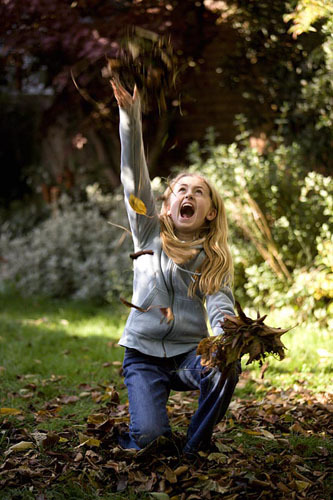 Having children is equally a life altering experience but sometimes having children can be a worry for people who enjoy their garden because of the potential hazards you can face. If you use a range of tools in your garden, especially sharp objects such as shears or mowers ensure they are locked up safely. 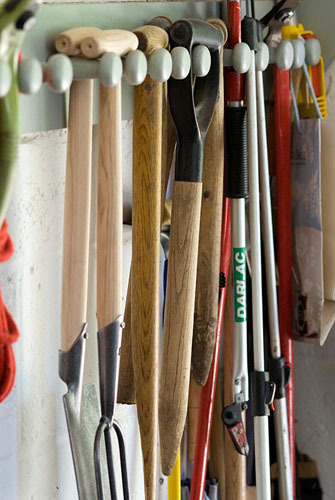 It is a good idea to ensure that any shed or garage is properly cordoned off, even if tools are locked away for maximum safety. Certain plants and flowers, though beautiful to look at have levels of toxicity that can be dangerous for children. Check all of the plants in your garden to make sure they will be safe to play there. Obviously certain plants are naturally prickly so should be removed to avoid any danger to your children. As mentioned, when children are smaller, fencing off hazardous areas such as sheds or pools can protect your children from harm. As children grow older and become naturally inquisitive, fences become climbing frames, unfortunately this cannot be avoided however composite fencing is more sturdy and therefore less likely to break under the weight of a climbing child and so should be considered as an alternative to traditional wood fencing if you have children. 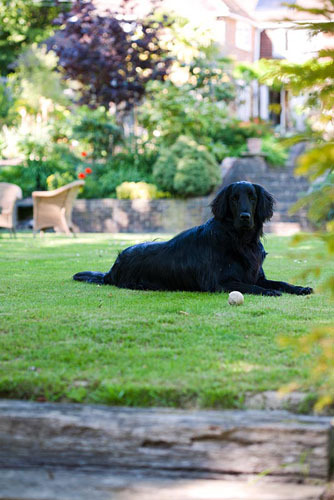 If you have a lawn ensure that it is free of debris before children play on it. Especially if you have pets who may leave mess on the surface of the lawn. It is always best to check if there are any uneven parts of the lawn like bumps so that your children cannot trip over them. No matter how much you childproof your garden it is always important to supervise your children at all times as they can always find a way to get themselves in trouble even with childproofing. And always teach your child about safe play and how to value the garden. We hope that this handy guide is a useful tool in keeping your children safe in the garden so they can have fun in it and you can return to relaxing and enjoying your garden too. Timco Wood is a UK based company which produces environmentally friendly composite wood products that are FSC® certified and fully recyclable. The range includes decking, fencing and cladding to provide durable and sustainable additions to any garden area. Follow Timco Wood on Twitter by clicking here. This entry was posted in Expert advice on July 29, 2014 by gapadmin. Herbs may be a practical choice but that’s no reason not to show them off. Groups of container grown herbs given the sunshine and conditions they love, will happily show off for you. 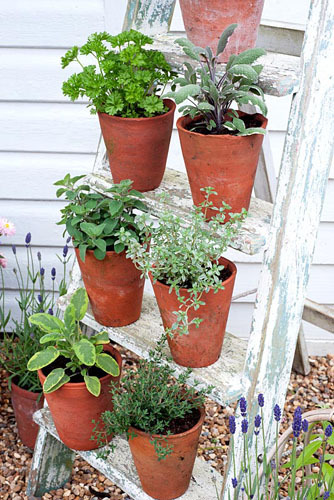 Use a vintage wooden step-ladder as decorative shelves placing the more aromatic herbs higher up to ensure you catch their scent as you pass. 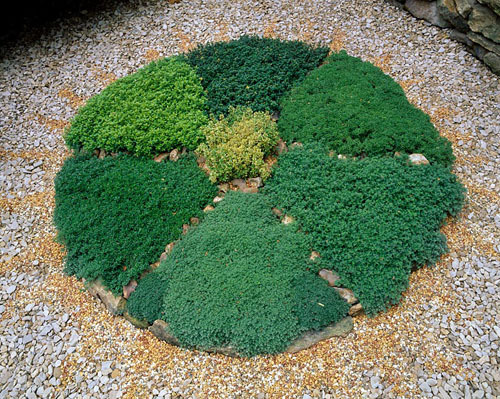 Make an attractive feature of your herbs with a herb wheel; popularised by the Victorians, this is a practical and attractive garden feature. 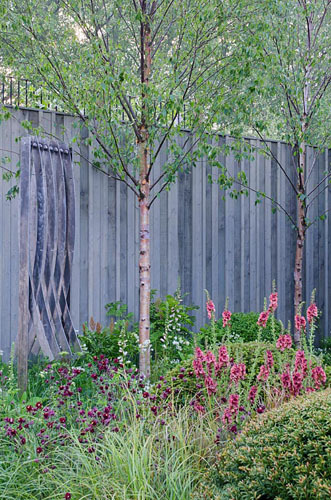 Essentially a formal garden feature but there is no reason why you need to stick to tradition. If space is at a premium, consider creating a container mini herb wheel or garden. 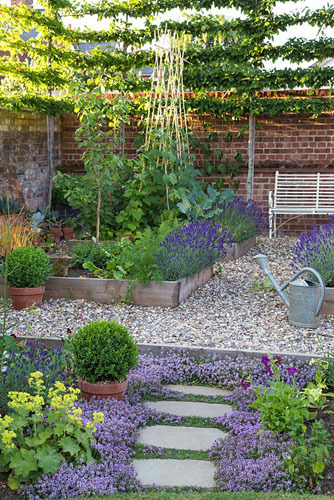 Herbs prefer a sunny, sheltered spot and well-drained soil. If using a metal container you need to drill holes in the bottom to avoid water logging in wet conditions. If you do have space, why not create a potager – of French origin, a potager is an attractive garden of vegetables, herbs and flowers, often edible – arranged to be aesthetically pleasing. Choosing plants for their beauty as much as their flavour is key to creating a potager so plan which colours and textures will compliment each other – for example, the deep coloured purple sage leaf will look stunning beside the lime green feathery fennel. 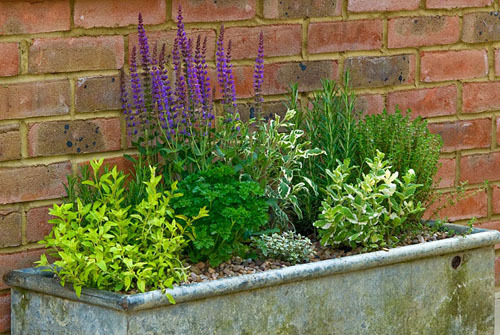 Another larger option is a herb garden. Often influenced by a traditional plan of beds intersected by geometric paths, with a fountain or ornamental feature in the centre, herb gardens of this type date back to medieval Europe and in particular Benedictine monasteries. The design is still in use as it makes the cultivation and harvest easier. 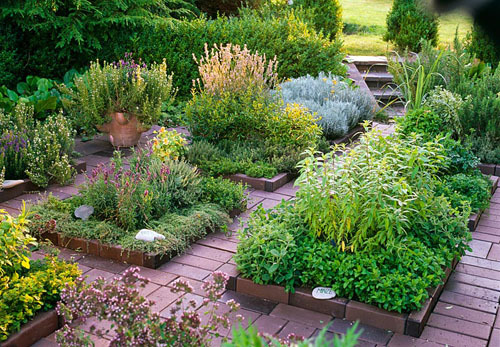 Or you could just allocate one bed or border to herbs. 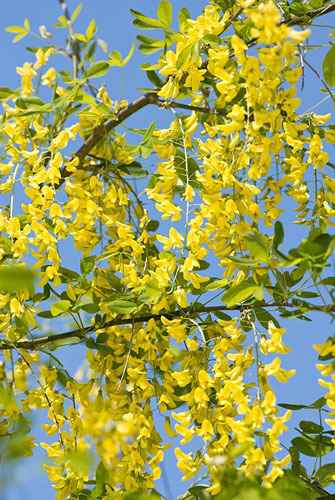 This entry was posted in Expert advice, Practical gardening on July 24, 2014 by gapadmin.